Download "FACULTY OF EDUCATION. 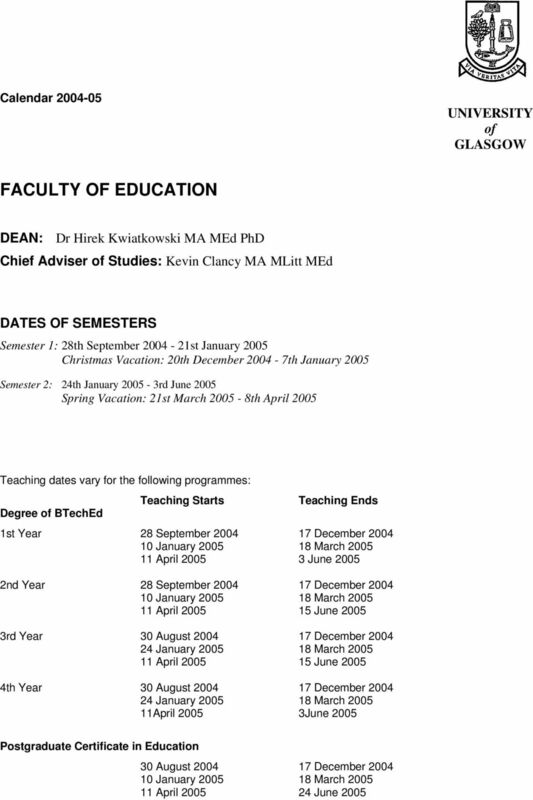 DEAN: Dr Hirek Kwiatkowski MA MEd PhD Chief Adviser of Studies: Kevin Clancy MA MLitt MEd DATES OF SEMESTERS"
6 Ed.6 Degree of BTechnol Education and BTechnol Studies i) A candidate who has obtained a minimum of 240 credits at grade D or better from courses in the BEd curriculum will be eligible to receive the Diploma of Higher Education. Candidates who receive a Degree will not receive a Diploma. ii) The Diploma of Higher Education may be awarded with Merit or Distinction. 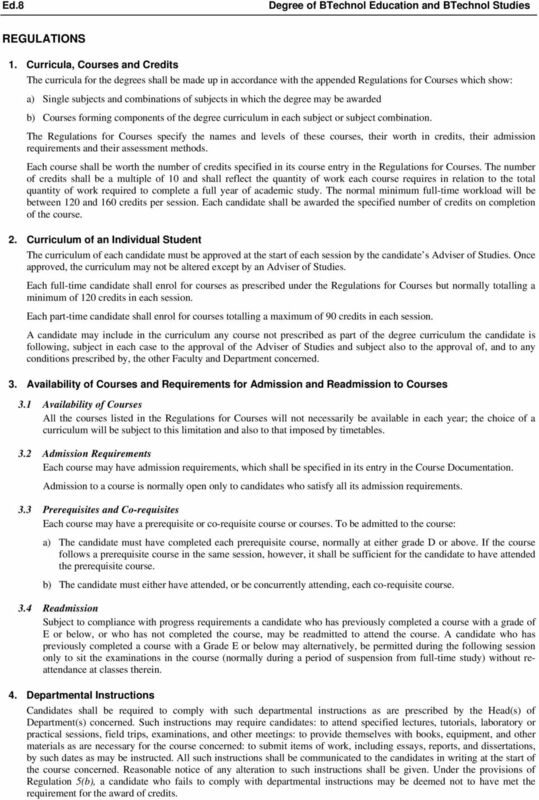 Regulations for Students on Course before Session 2002/2003 (Old Regulations) The Regulations for students on course before 2002/2003 are as set out in the regulations (above) with the exceptions of 2.1 a) and 4.1. Regulations 2.1 a) and 4.2 for students on course before session 2002/3 are as follows: 2.1 The Honours Degree shall consist of compulsory components and elective components. 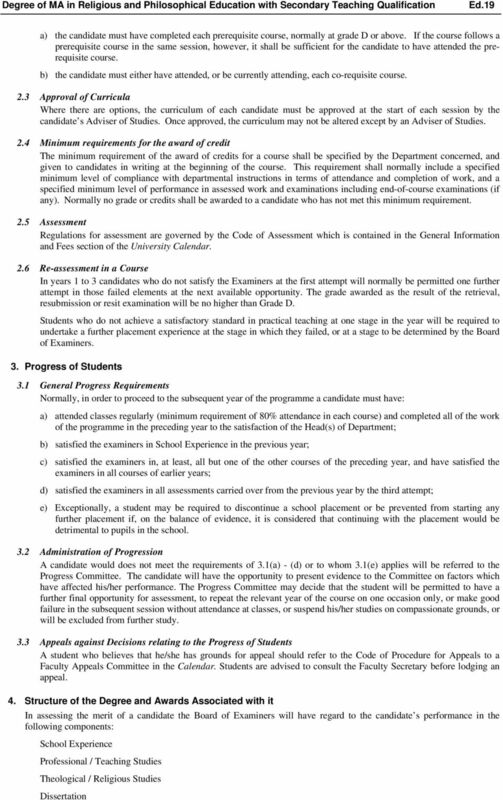 a) the compulsory components are: School Experience (years 1-4) Educational Studies (years 1-4) Environmental Education (years 1-4) Expressive Arts (years 1-4) Professional and Curricular Research Assessment (years 3-4) Language (years 1-4) Mathematics (years 1-4) Religious Education (years 1-4) In assessing the merit of a candidate for the Degree with Honours the Board of Examiners will have regard to the candidate s performance in the following components: School Experience Professional Studies Advanced Language Advanced Mathematics Specialist Study Professional and Curricular Research Assessment. IV DEGREES OF BACHELOR OF TECHNOLOGICAL EDUCATION & BACHELOR OF TECHNOLOGY STUDIES From October 2002, students entering the Degree of Bachelor of Technological Education (BTechEd) will be matriculated in the Faculty of Education. Students admitted to the Degree before October 2002 will continue to be matriculated in the Faculty of Engineering. Both groups of students should refer to the following Resolution and Regulations. The provisions of the Resolution governing the Degrees of Bachelor of Technological Education and Bachelor of Technology Studies are as follows: 1. 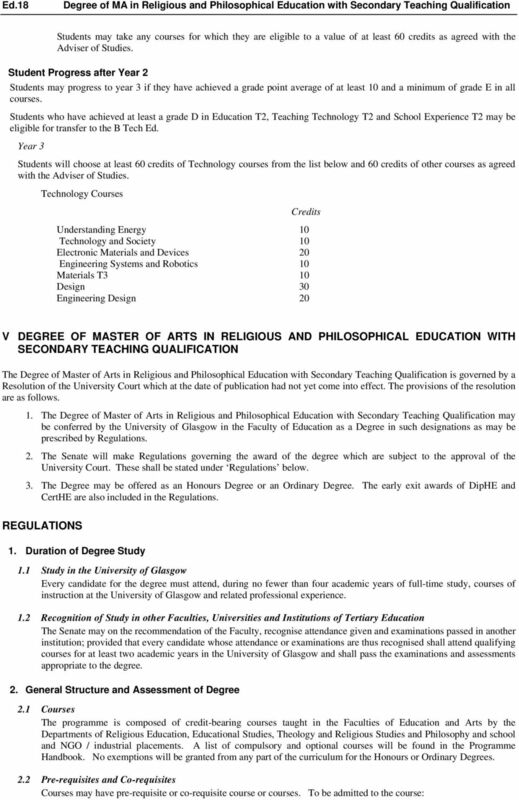 The following degrees may be conferred by the University of Glasgow: Bachelor of Technological Education (B Tech Ed) Bachelor of Technology Studies (B Tech S) The following may also be conferred as other qualifications: Diploma of Higher Education (Technology Studies) Certificate of Higher Education (Technology Studies) 2. 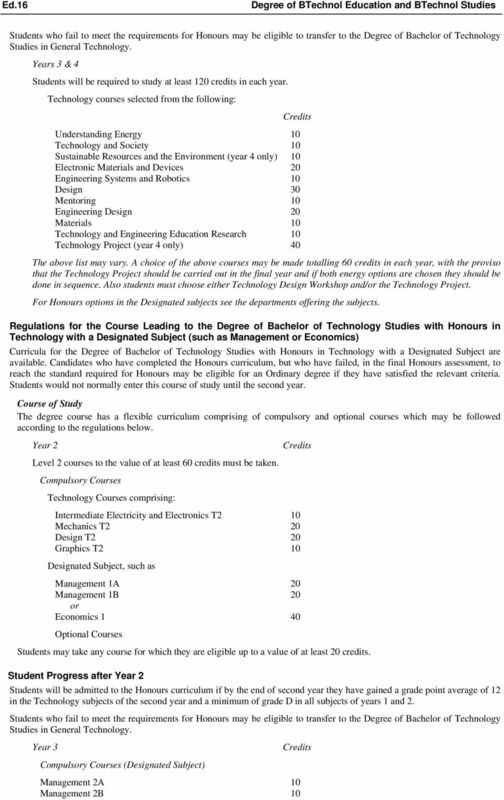 The Degree of Bachelor of Technological Education may be conferred as a degree with Honours or with a Pass or as an Ordinary degree as prescribed by regulation. The Degree of Bachelor of Technology Studies may be conferred either as a degree with Honours or with a Pass in such single subjects or pairs of subjects as may be prescribed by regulation. The Degree of Bachelor of Technology Studies in General Technology may be conferred as a degree as may be prescribed by regulation. 3. The minimum period of study for the degrees and other qualifications shall normally be as follows: a) Bachelor of Technological Education - four sessions of full-time study or two sessions of full-time study preceded by at least three sessions of part-time study. b) Bachelor of Technology Studies with Honours - four sessions of full-time study or two sessions of full-time study preceded by at least three sessions of part-time study. 7 Degree of BTechnol Education and BTechnol Studies Ed.7 c) Bachelor of Technology Studies in General Technology - three sessions of full-time study or at least four sessions of part-time study. Exceptionally, other combinations of full-time and part-time study may be approved by the Senate in individual cases. d) Diploma of Higher Education (Technology Studies) - two sessions of full-time or at least three sessions of parttime study. e) Certificate of Higher Education (Technology Studies) - one session of full-time or two sessions of part-time study. 4. 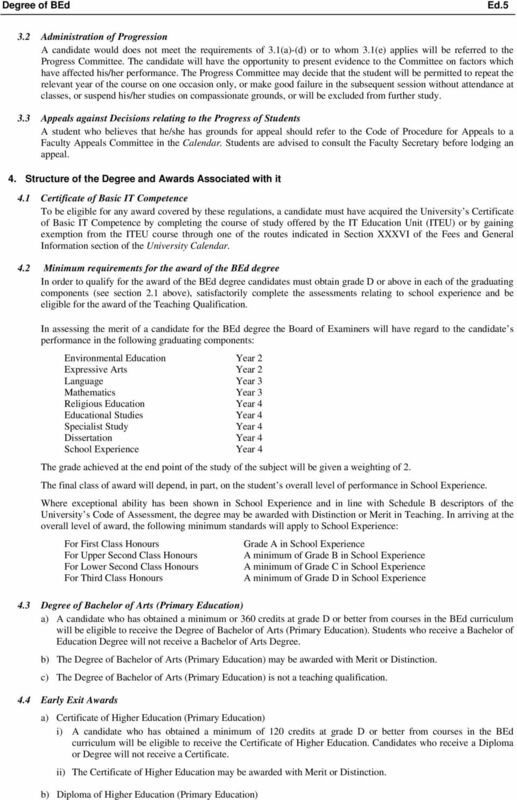 A candidate who has not met the particular requirements for one of the following degrees or other qualifications: i) Bachelor of Technological Education with Honours or ii) Bachelor of Technology Studies in Technology with a Designated Subject with Honours or iii) Bachelor of Technological Education iv) Bachelor of Technology Studies in General Technology or v) Diploma in Higher Education (Technology Studies) or i) Certificate in Higher Education (Technology Studies) OR i) Bachelor of Technology Studies in Technology and a Designated Subject with Honours or ii) Bachelor of Technology Studies in Technology with a Designated Subject with Honours or iii) Bachelor of Technology Studies in General Technology or iv) Diploma in Higher Education (Technology Studies) or v) Certificate in Higher Education (Technology Studies) who at any stage of the curriculum is judged unlikely to meet the requirements, may be required to transfer to the curriculum for another degree or another qualification lower in order in the above lists. A candidate making adequate progress in the curriculum for which he or she is enrolled may be permitted to transfer to the curriculum for another degree or another qualification lower in order in the above list than the degree or diploma for which the candidate is currently enrolled. A candidate who transfers between curricula for degrees or other qualifications may be exempted in whole or in part from the examinations prescribed for the degree or other qualification to which the candidate has transferred, dependent upon results gained in the previous curriculum. 5. a) Candidates may be exempted from part of the curriculum in accordance with the Regulations paragraph 12 made under this resolution. 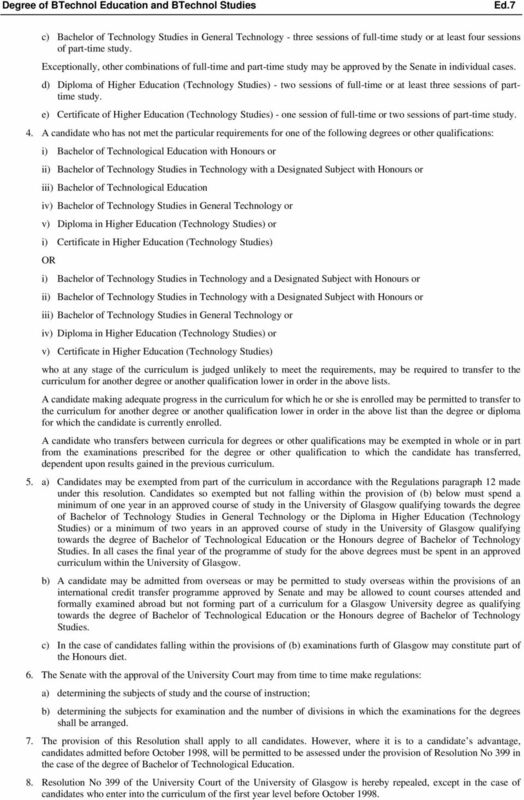 Candidates so exempted but not falling within the provision of (b) below must spend a minimum of one year in an approved course of study in the University of Glasgow qualifying towards the degree of Bachelor of Technology Studies in General Technology or the Diploma in Higher Education (Technology Studies) or a minimum of two years in an approved course of study in the University of Glasgow qualifying towards the degree of Bachelor of Technological Education or the Honours degree of Bachelor of Technology Studies. 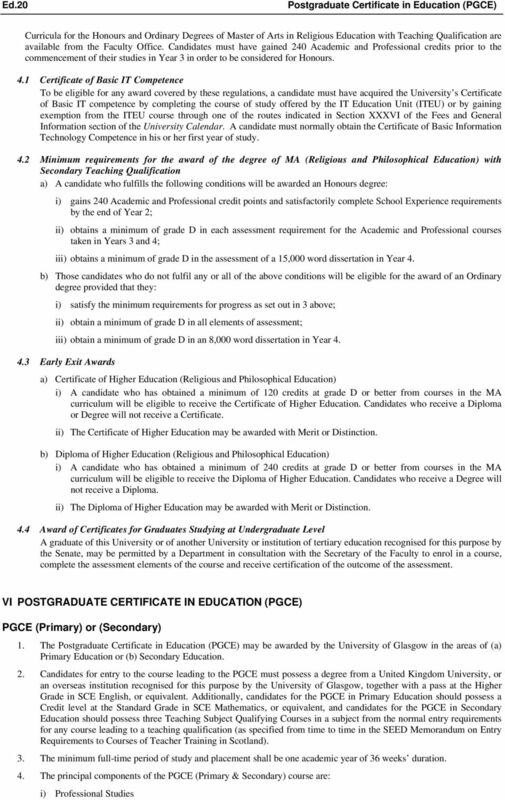 In all cases the final year of the programme of study for the above degrees must be spent in an approved curriculum within the University of Glasgow. b) A candidate may be admitted from overseas or may be permitted to study overseas within the provisions of an international credit transfer programme approved by Senate and may be allowed to count courses attended and formally examined abroad but not forming part of a curriculum for a Glasgow University degree as qualifying towards the degree of Bachelor of Technological Education or the Honours degree of Bachelor of Technology Studies. c) In the case of candidates falling within the provisions of (b) examinations furth of Glasgow may constitute part of the Honours diet. 6. The Senate with the approval of the University Court may from time to time make regulations: a) determining the subjects of study and the course of instruction; b) determining the subjects for examination and the number of divisions in which the examinations for the degrees shall be arranged. 7. The provision of this Resolution shall apply to all candidates. However, where it is to a candidate s advantage, candidates admitted before October 1998, will be permitted to be assessed under the provision of Resolution No 399 in the case of the degree of Bachelor of Technological Education. 8. 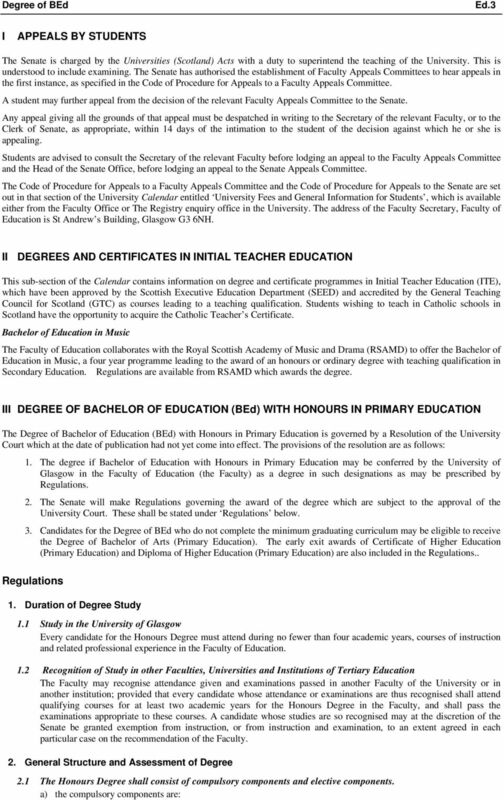 Resolution No 399 of the University Court of the University of Glasgow is hereby repealed, except in the case of candidates who enter into the curriculum of the first year level before October 1998. 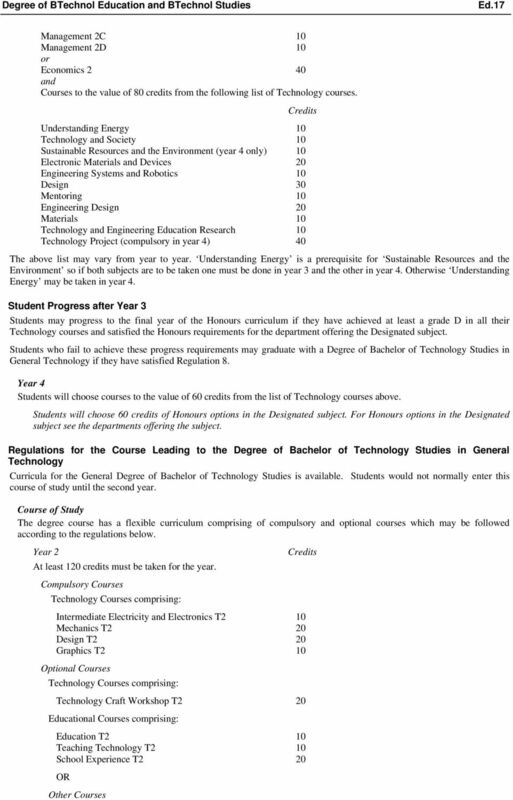 8 Ed.8 Degree of BTechnol Education and BTechnol Studies REGULATIONS 1. Curricula, Courses and Credits The curricula for the degrees shall be made up in accordance with the appended Regulations for Courses which show: a) Single subjects and combinations of subjects in which the degree may be awarded b) Courses forming components of the degree curriculum in each subject or subject combination. The Regulations for Courses specify the names and levels of these courses, their worth in credits, their admission requirements and their assessment methods. Each course shall be worth the number of credits specified in its course entry in the Regulations for Courses. The number of credits shall be a multiple of 10 and shall reflect the quantity of work each course requires in relation to the total quantity of work required to complete a full year of academic study. The normal minimum full-time workload will be between 120 and 160 credits per session. Each candidate shall be awarded the specified number of credits on completion of the course. 2. Curriculum of an Individual Student The curriculum of each candidate must be approved at the start of each session by the candidate s Adviser of Studies. Once approved, the curriculum may not be altered except by an Adviser of Studies. Each full-time candidate shall enrol for courses as prescribed under the Regulations for Courses but normally totalling a minimum of 120 credits in each session. Each part-time candidate shall enrol for courses totalling a maximum of 90 credits in each session. 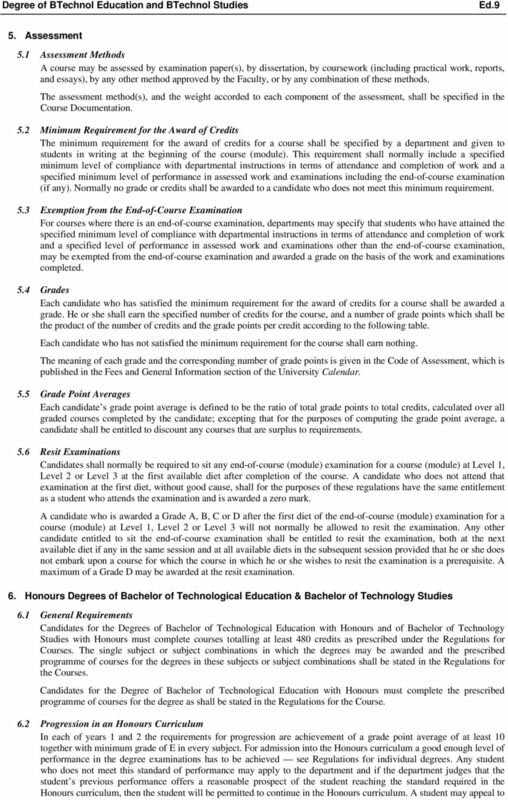 A candidate may include in the curriculum any course not prescribed as part of the degree curriculum the candidate is following, subject in each case to the approval of the Adviser of Studies and subject also to the approval of, and to any conditions prescribed by, the other Faculty and Department concerned. 3. Availability of Courses and Requirements for Admission and Readmission to Courses 3.1 Availability of Courses All the courses listed in the Regulations for Courses will not necessarily be available in each year; the choice of a curriculum will be subject to this limitation and also to that imposed by timetables. 3.2 Admission Requirements Each course may have admission requirements, which shall be specified in its entry in the Course Documentation. Admission to a course is normally open only to candidates who satisfy all its admission requirements. 3.3 Prerequisites and Co-requisites Each course may have a prerequisite or co-requisite course or courses. To be admitted to the course: a) The candidate must have completed each prerequisite course, normally at either grade D or above. If the course follows a prerequisite course in the same session, however, it shall be sufficient for the candidate to have attended the prerequisite course. b) The candidate must either have attended, or be concurrently attending, each co-requisite course. 3.4 Readmission Subject to compliance with progress requirements a candidate who has previously completed a course with a grade of E or below, or who has not completed the course, may be readmitted to attend the course. A candidate who has previously completed a course with a Grade E or below may alternatively, be permitted during the following session only to sit the examinations in the course (normally during a period of suspension from full-time study) without reattendance at classes therein. 4. Departmental Instructions Candidates shall be required to comply with such departmental instructions as are prescribed by the Head(s) of Department(s) concerned. Such instructions may require candidates: to attend specified lectures, tutorials, laboratory or practical sessions, field trips, examinations, and other meetings: to provide themselves with books, equipment, and other materials as are necessary for the course concerned: to submit items of work, including essays, reports, and dissertations, by such dates as may be instructed. All such instructions shall be communicated to the candidates in writing at the start of the course concerned. Reasonable notice of any alteration to such instructions shall be given. Under the provisions of Regulation 5(b), a candidate who fails to comply with departmental instructions may be deemed not to have met the requirement for the award of credits. 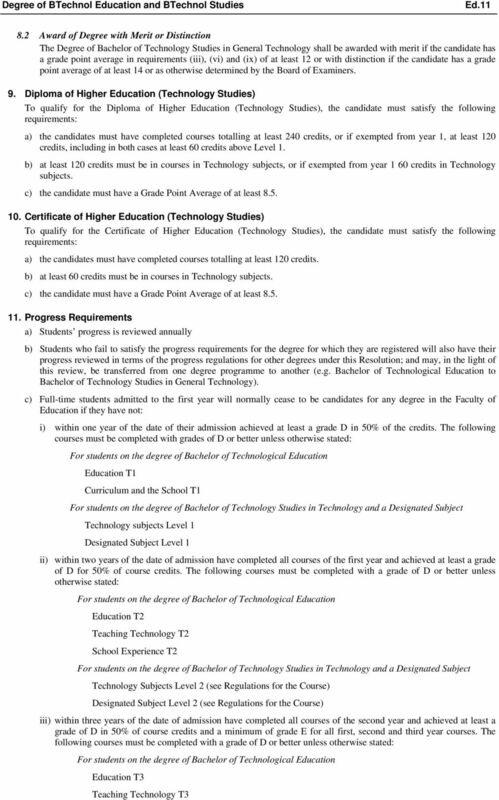 10 Ed.10 Degree of BTechnol Education and BTechnol Studies the Faculty Appeals Committee against refusal of continuation in an Honours Curriculum or in the case Joint Degrees with another Faculty a Joint Appeals Committee. 6.3 Award of Honours The Board of Examiners will award a class of Honours based on a weighted average of marks normally comprising those for the courses of Years 3 and 4 of the Degree of Bachelor of Technological Education and of the Degree of Bachelor of Technology Studies. A higher weighting may be given to the final year. The weighting for each Degree curriculum will be published in the appropriate Course Handbook. In making the award, the Board of Examiners may also have regard to the candidate s performance throughout the curriculum. The examination marks used in calculating the weighted average will normally be those achieved at the first available diet of examinations. In the case of Joint Honours the Joint Board of Examiners shall be entitled to set a minimum standard in either of the combined subjects to qualify the candidate for a particular class of Honours. In assessing the merit of a candidate for the Degree with Honours the Board of Examiners may have regard to the candidate s performance not only in the Honours examination but also in all the other subjects of the curriculum. Award of a First Class Honours for the Bachelor of Technological Education is dependent upon a candidate receiving an overall grade A for School Experience. 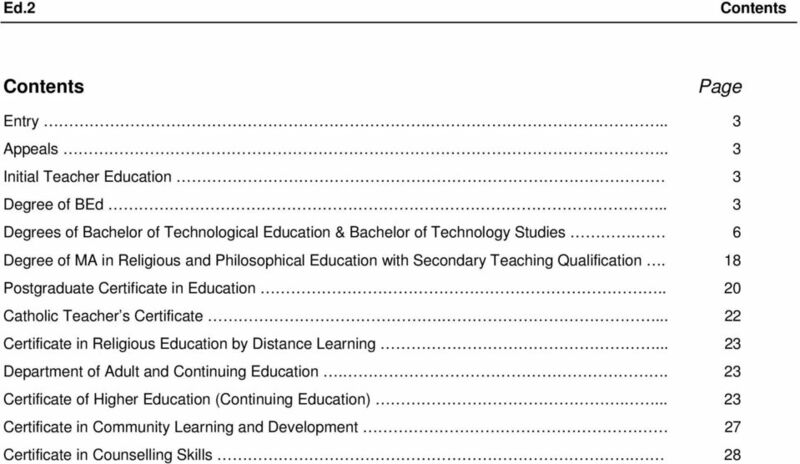 6.4 Merit in Teaching A candidate who has received an overall grade A for School Experience should be awarded a Bachelor of Technological Education Degree with Honours with Merit in Teaching. 6.5 Deferment of Honours Examination A candidate for the degree with Honours shall normally present himself or herself for examination immediately upon completion of the prescribed courses. However, a Head of Department may, at his or her discretion and on grounds of illness or other good cause shown, permit a candidate to delay taking his or her final Honours examination for not more than one year. 7. Degree of Bachelor of Technological Education (Ordinary) A candidate for the Degree of Bachelor of Technological Education (Ordinary) must complete courses totalling at least 400 credits as prescribed under the Regulations for the courses. A candidate who in the opinion of the Board of Examiners has shown special merit may be awarded the Degree of Bachelor of Technological Education with Commendation. A candidate who has received an overall Grade A for School Experience should be awarded a Bachelor of Technological Education Degree (Ordinary) with Merit in Teaching. 8. 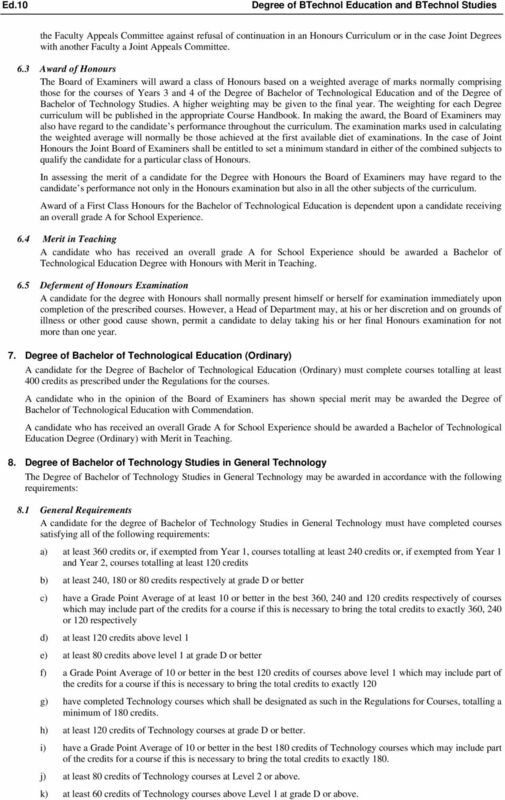 Degree of Bachelor of Technology Studies in General Technology The Degree of Bachelor of Technology Studies in General Technology may be awarded in accordance with the following requirements: 8.1 General Requirements A candidate for the degree of Bachelor of Technology Studies in General Technology must have completed courses satisfying all of the following requirements: a) at least 360 credits or, if exempted from Year 1, courses totalling at least 240 credits or, if exempted from Year 1 and Year 2, courses totalling at least 120 credits b) at least 240, 180 or 80 credits respectively at grade D or better c) have a Grade Point Average of at least 10 or better in the best 360, 240 and 120 credits respectively of courses which may include part of the credits for a course if this is necessary to bring the total credits to exactly 360, 240 or 120 respectively d) at least 120 credits above level 1 e) at least 80 credits above level 1 at grade D or better f) a Grade Point Average of 10 or better in the best 120 credits of courses above level 1 which may include part of the credits for a course if this is necessary to bring the total credits to exactly 120 g) have completed Technology courses which shall be designated as such in the Regulations for Courses, totalling a minimum of 180 credits. h) at least 120 credits of Technology courses at grade D or better. i) have a Grade Point Average of 10 or better in the best 180 credits of Technology courses which may include part of the credits for a course if this is necessary to bring the total credits to exactly 180. j) at least 80 credits of Technology courses at Level 2 or above. 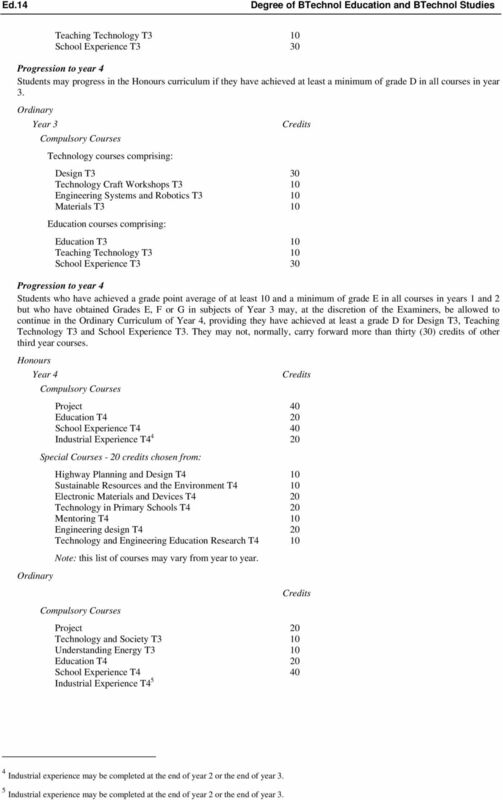 k) at least 60 credits of Technology courses above Level 1 at grade D or above. 13 Degree of BTechnol Education and BTechnol Studies Ed.13 Design T1 30 Technology Craft Workshops T1 20 Graphics T1 10 Education courses comprising: Education T1 10 Curriculum and the School T1 10 Student Progress after Year 1 Students may progress to year 2 of the curriculum if they have achieved at least a grade D in Education T1 and Curriculum and the School T1 together with a grade point average of 10 and a minimum of grade E in no more than one Technology subject. Students who achieved a Grade D in all subjects may transfer to the Degree of Bachelor of Technology Studies in Technology with a Designated subject. Students who have achieved a grade point average of at least 10 and a minimum of grade E in all courses (except Education T1 and Curriculum and the School T1) may transfer to the Bachelor of Technology Studies in General Technology Degree. Year 2 Credits Compulsory Courses Technology courses comprising: Mechanics T2 20 Intermediate Electricity and Electronics T2 10 Design T2 20 Technology Craft Workshop T2 20 Graphics T2 10 Education courses comprising: Education T2 10 Teaching Technology T2 10 School Experience T2 20 Direct Entrants Bridging Course 2 10 Optional course Religious Education (Catholic) 3 Student Progress after Year 2 Students will be admitted to the Honours curriculum if by the end of second year they have gained a grade point average of 12 in the subjects of the second year and a minimum of grade D in all subjects of years 1 and 2. Students may progress to Year 3 of the Ordinary curriculum if they achieved at least a grade D in Education T2, Teaching Technology T2 and School Experience T2, together with a grade point average of at least 10 and a minimum of grade E in all courses from years 1 and 2. All candidates must, explicitly, have performed satisfactorily during their periods of School Experience. Students who have achieved a grade point average of at least 10 and a minimum of grade E in all courses (except Education T2, Teaching Technology T2 and School Experience T2) may transfer to the Degree of Bachelor of Technology Studies in General Technology. Honours Year 3 Compulsory Courses Credits Technology courses comprising: Understanding Energy T3 10 Engineering Systems and Robotics T3 10 Design T3 30 Technology and Society T3 10 Materials T3 10 Technology Craft Workshops T3 10 Education courses comprising: Education T Direct Entrants Bridging Course is compulsory only for direct entrants into second year. 3 For students wishing to have the Catholic Teacher s Certificate, and must be satisfactorily completed by the end of year 4. 14 Ed.14 Degree of BTechnol Education and BTechnol Studies Teaching Technology T3 10 School Experience T3 30 Progression to year 4 Students may progress in the Honours curriculum if they have achieved at least a minimum of grade D in all courses in year 3. Ordinary Year 3 Compulsory Courses Credits Technology courses comprising: Design T3 30 Technology Craft Workshops T3 10 Engineering Systems and Robotics T3 10 Materials T3 10 Education courses comprising: Education T3 10 Teaching Technology T3 10 School Experience T3 30 Progression to year 4 Students who have achieved a grade point average of at least 10 and a minimum of grade E in all courses in years 1 and 2 but who have obtained Grades E, F or G in subjects of Year 3 may, at the discretion of the Examiners, be allowed to continue in the Ordinary Curriculum of Year 4, providing they have achieved at least a grade D for Design T3, Teaching Technology T3 and School Experience T3. They may not, normally, carry forward more than thirty (30) credits of other third year courses. Honours Year 4 Compulsory Courses Credits Ordinary Project 40 Education T4 20 School Experience T4 40 Industrial Experience T Special Courses - 20 credits chosen from: Highway Planning and Design T4 10 Sustainable Resources and the Environment T4 10 Electronic Materials and Devices T4 20 Technology in Primary Schools T4 20 Mentoring T4 10 Engineering design T4 20 Technology and Engineering Education Research T4 10 Note: this list of courses may vary from year to year. Compulsory Courses Credits Project 20 Technology and Society T3 10 Understanding Energy T3 10 Education T4 20 School Experience T4 40 Industrial Experience T4 5 4 Industrial experience may be completed at the end of year 2 or the end of year 3. 5 Industrial experience may be completed at the end of year 2 or the end of year 3. 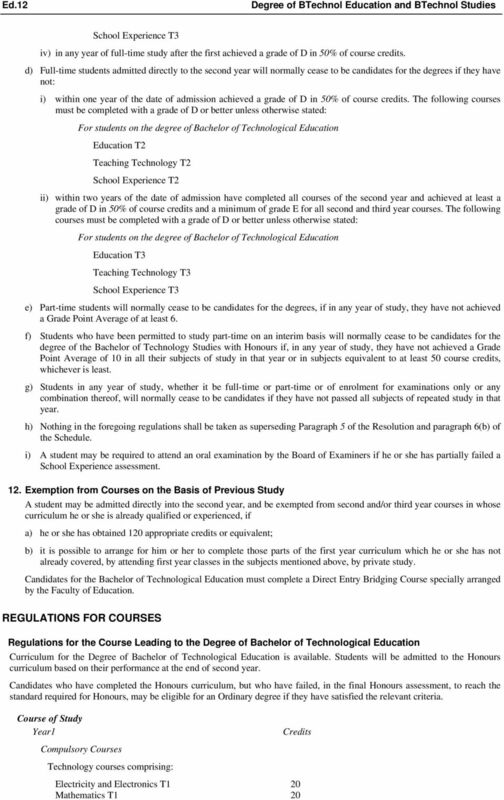 15 Degree of BTechnol Education and BTechnol Studies Ed.15 Regulations for the Course Leading to the Degree of Bachelor of Technology Studies in Technology and a Designated Subject (such as Management or Economics). 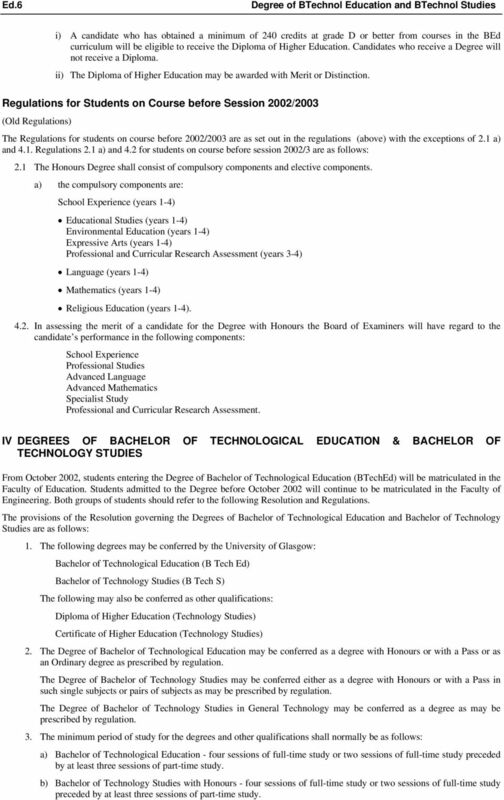 Curricula for Honours Degree of Bachelor of Technology Studies in Technology and a Designated Subject are available. Students will be admitted to the Honours curriculum based on their performance at the end of second year. Candidates who have completed the Honours curriculum, but who have failed, in the final Honours assessment, to reach the standard required for Honours may be eligible for an Ordinary degree if they have satisfied the relevant criteria. Course of Study The degree has a mixed curriculum comprising of compulsory and optional subjects which may be followed according to the regulations below. Year 1 Credits Level 1 courses must be taken to a total of at least 120 credits Compulsory Courses Technology Courses comprising: Electricity and Electronics T1 20 Mathematics T1 20 Design T1 30 Graphics T1 10 Designated Subjects comprising (for example): Management 1A 20 Management 1B 20 Or Economics 1 40 Student Progress after Year 1 Students may progress to year 2 of the curriculum if they have achieved at least a grade D in all the courses of year 1. Students may transfer to the degree of Bachelor of Technology Studies with a Designated subject, if they have achieved at least a grade D in all the subjects of year 1. 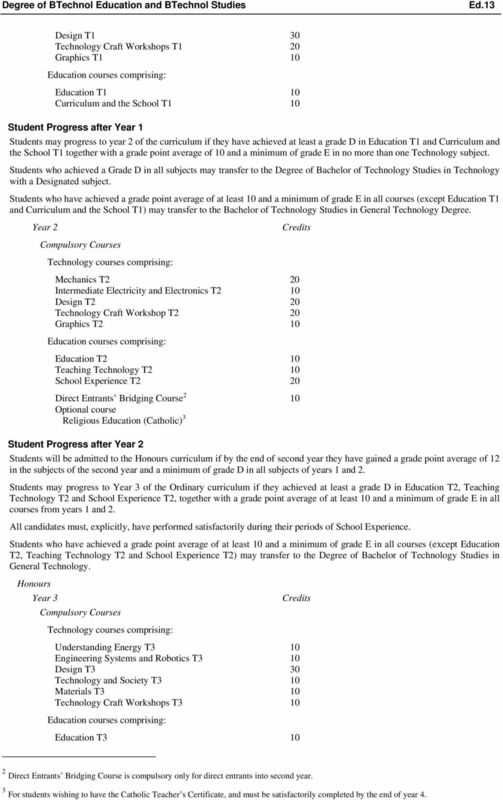 Students who have achieved a grade point average of at least 10 and a minimum of grade E in all courses may transfer to the degree of Bachelor of Technology Studies in General Technology. Year 2 Credits Level 2 courses totaling at least 60 credits must be taken. 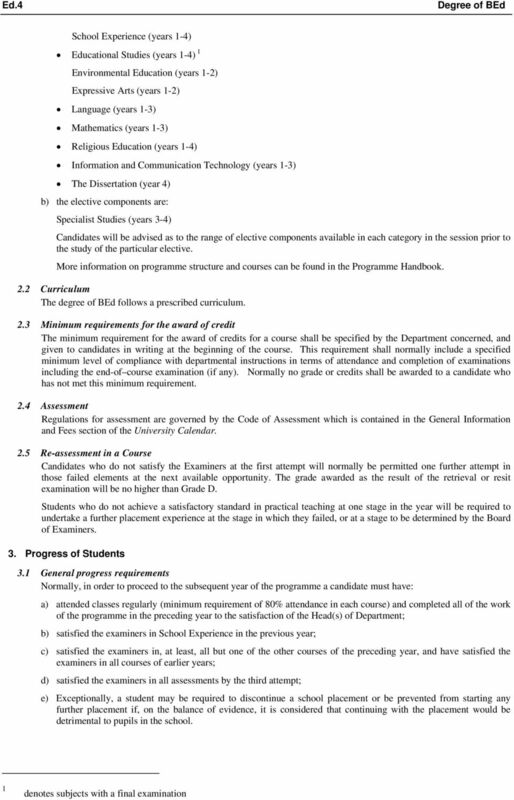 Compulsory Courses Technology Courses comprising: Intermediate Electricity and Electronics T2 10 Mechanics T2 20 Design T2 20 Graphics T2 10 Designated Subjects comprising (for example): Management 2A 10 Management 2B 10 Management 2C 10 Management 2D 10 OR Other courses Economics 2 40 Students may take any course for which they are eligible up to a value of at least 20 credits as agreed with the Adviser of Studies. 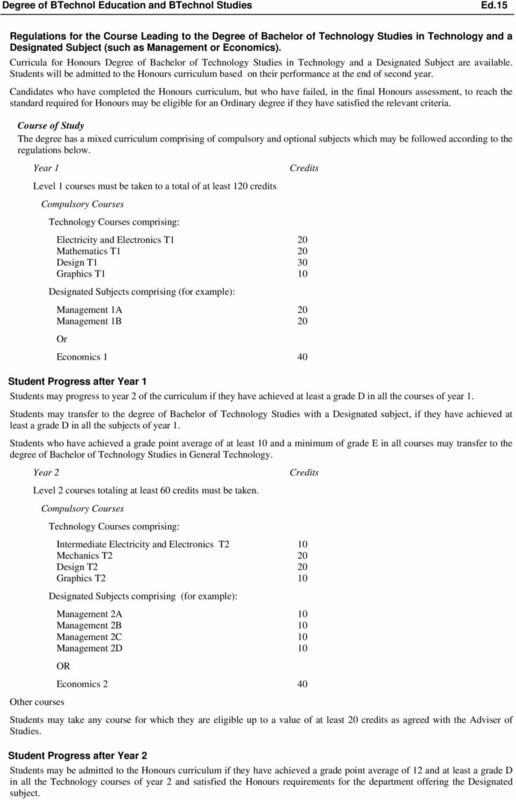 Student Progress after Year 2 Students may be admitted to the Honours curriculum if they have achieved a grade point average of 12 and at least a grade D in all the Technology courses of year 2 and satisfied the Honours requirements for the department offering the Designated subject. FACULTY OF ARTS. DEAN: Professor John M Caughie MA Chief Adviser of Studies: Heather Lloyd BA PhD DATES OF SEMESTERS. Page. Statute A4 Degree of Bachelor of Arts (Education) 1. The period of study for the degree of Bachelor of Arts (Education) is four academic years.